Talk about 2 extremes. Not far removed from the most expensive meal I've ever had at Tojo's, I find myself at the Lougheed location of Sushi Garden. Famous for their large portions at reasonable prices, this is definitely quantity over quality. Sure, it ain't Japanese-run, the food isn't exactly made carefully and the service is spotty; but for the prices, we do have to make compromises. A long time ago, Snake had introduced us to the original location on Kingsway across from Metrotown. 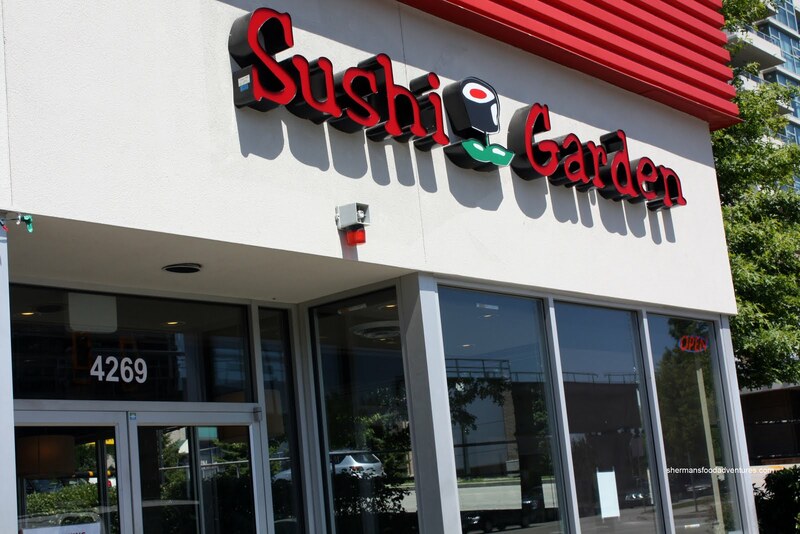 Back then, Sushi Garden was only a small one storefront operation. Once they expanded into the next store, everything seemed to be more mass produced and hurried. Yet, I totally get it. Low prices + large quantities = lots of customers; hence quick turnover = more profits. Replacing a former computer bookstore (I have no idea how it stayed in business for that long), the new Sushi Garden has a nice decor and pretty decent washrooms. It's really too bad that the floor looks like the aftermath of a Peter North flick. They really need to clean it! My sandals kept sticking to the tiles... ewww... Now, one of the biggest complaints about Sushi Garden is the servic e, or the lack of. It wasn't very busy, so for us, the service was quite friendly. However, it was still quite sparse for some apparent reason. I guess that is one thing consistent with both locations. Once again, for the prices and quantities, we must make compromises... Oh, and another compromise at this location specifically is the lack of parking spots. The main parking lot is mainly used by Staples (with more on the upper level). So there are very few spots left for Sushi Garden and Church's Fried Chicken. We were lucky to get a parking spot since it was later in the afternoon. That probably helped us avoid lining up too, as we got a table immediately. I liked how the wood banquettes looked; but honestly, provide some cushions. 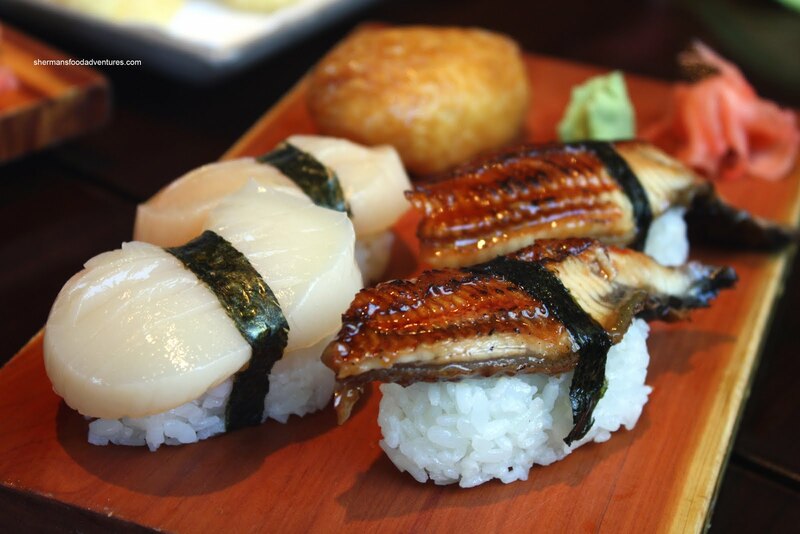 We started out with some of their reasonably-priced Nigiri (Hotate, Unagi & Inari). As you can see in the picture, the portion size is large. Nothing remarkable about the nigiri while at the same time, it was solid. The sushi rice could've been better, it was dry and bland. 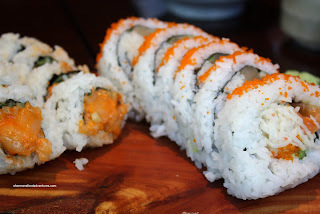 With the same sushi rice and lacking care in its preparation, the Scallop & Tobiko Roll was okay. Same could be said about the House Roll. It was definitely huge and a good value; but little else. Rather than the usual sashimi, we got the Spicy Salmon. 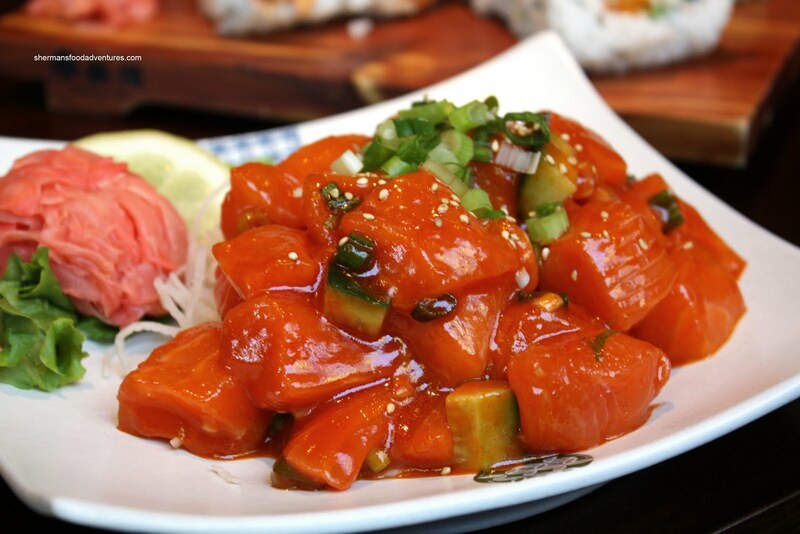 We liked how it was a bit sweet and spicy while not being drenched in sauce. We could still taste the salmon, which was actually pretty good. Nice crunch from the bits of cucumber too. Oh, isn't that the biggest clump of ginger you've ever seen??? 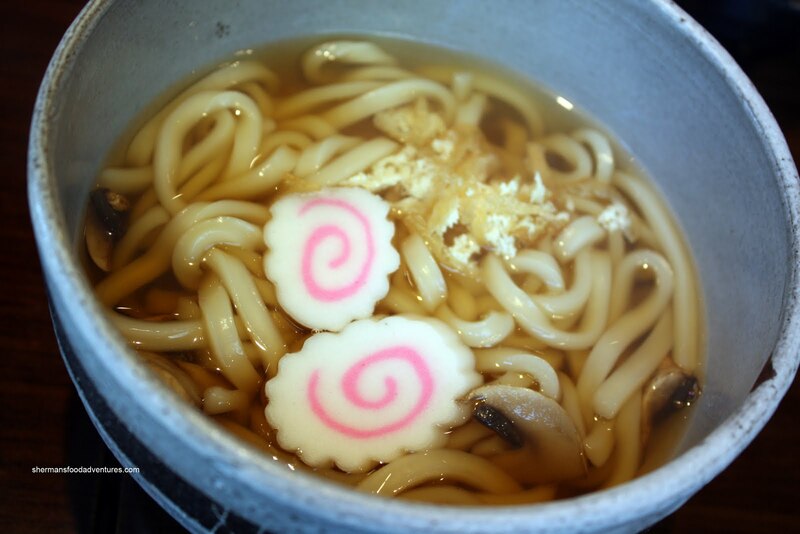 Since the whole family was out today, it can only mean one thing - Tempura Udon. This is one of the few items they are willing to eat at a Japanese restaurant. The udon itself was nicely cooked with a chewy texture. The broth was weak, only exhibiting sweetness and very little else. The accompanying Tempura was not very good. With too much batter that was slightly undercooked, we didn't enjoy it so much. In fact, there was uncooked batter in a few pieces. Confusingly, the last item to arrive was the Seafood Salad (and it arrived very much later). Looks like they wanted to mass produce it since 4 orders hit the dining room at the same time. Well, that would be one reason they can charge these prices - efficiency. 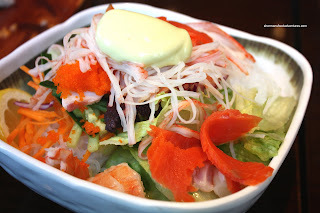 For the price, this was a pretty big salad with pieces of tako, salmon, tuna, ebi and imitation crab on top of a bed of iceberg lettuce. A large bowl of dressing was served on the side. I have to admit the meal was mostly decent. Considering the portion size and low prices, there is not much to complain about, even though some of the stuff was average to below-average. 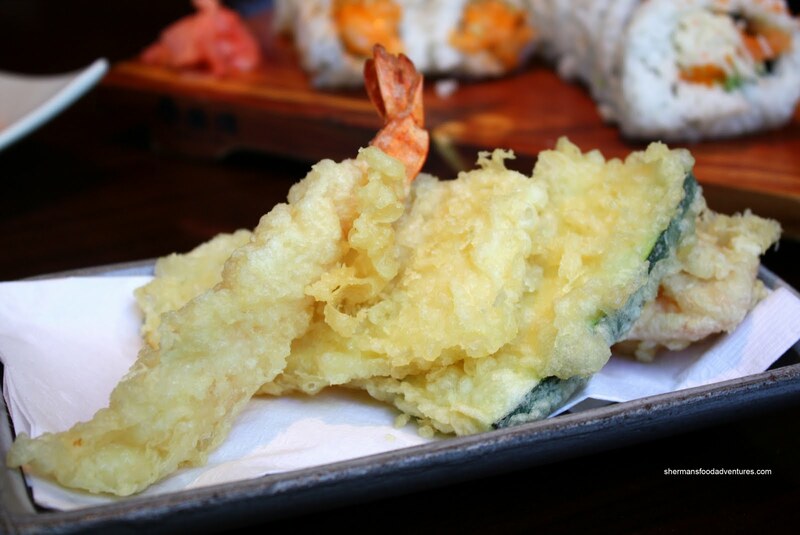 The bustling sushi bar cranks out an amazing amount of food in a short amount of time. Thus, quality suffers. However, Sushi Garden, much like Sushi Town and Samurai Sushi are not about being intricate and careful. Rather, their popularity rests on being efficient, high-turnover and good value. If this is what you want, then you'll be very satisfied. If you want something with higher quality that is made with care, this is not your place. Who the heck is Peter North ? I've been to this Sushi Garden. Like the White Spot/Bino's/Denny's of sushi ..... tolerable but certainly not memorable by any stretch of the imagination. Ms. Fab-u-lous, it is disturbing ain't it??? The Peter North mention came out of left field but gave me a long hard laugh. I'm going to assume the majority of readers won't get it until they wikipedia it. I've always heard of Sushi Garden but never got the chance to try it. The low prices really draw me to go try it but I've heard mostly mediocre reviews so far and horror stories about the service. I am always amazed by the line up that seems constant at that restaurant. I figured it was either really amazing or really cheap. Thanks for giving me the answer! Jer & HeyHeather, yup, it's cheap and large. Still good for a quick meal; but not if you want quality.